One of the eternal problems with a non-professional fictional detective is how they find time to solve the mystery. They can be brilliant (Sherlock Holmes), retired (Jessica Fletcher), wealthy (Nero Wolfe), or own their own business (everybody else). In cozy mysteries, owning a catering or craft shop is an oft repeated business for the protagonist. Eleanor Swift grew up in and now owns her own pizzeria, A Slice of Delight, in Timber Ridge, North Carolina. So when she flips over to the CLOSED sign, she can sleuth. Her sidekick is her much married sister Maddy who runs the front of the restaurant while Eleanor cooks. There’s big doings in town. Obnoxious diva TV Big Time Chef—and call him Chef not Antonio Benet—is coming with his entourage to open a new bookstore and sign his latest cookbook. Why he chose this little town as a venue is a mystery—but he probably he did not make the move intending to get murdered. 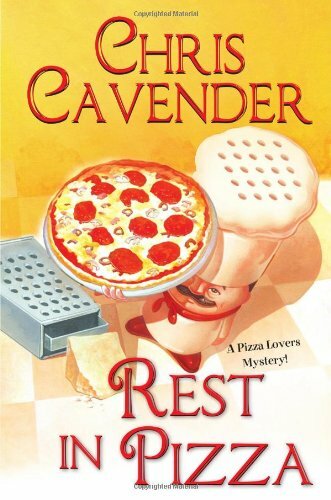 This cozy is charmingly written, but the plot has some major holes, surprising as it is written by Chris Cavender, the pseudonym for an Agatha Award Nominated Author who has appeared on the Independent Mystery Booksellers Association national bestseller list multiple times. Eleanor is a youngish widow dipping her big toe back into the dating pool and has a history with the police chief—they dated in high school—but one still has to wonder about a town where the restaurant owner gives the police chief tips about how to solve crimes. America is ghoulish, but would you want to go eat in a place in which a dead body was found 24 hours earlier? Weak alibis (and their destruction) add to the sense of a slapdash effort by the author. Maybe next time out Eleanor and Maddy can put their skills to use in an adventure that puzzles both the author and the reader.